Augustine, thus strengthened by the confirmation of the blessed Father Gregory, returned to the work of the word of God, with the servants of Christ, and arrived in Britain. 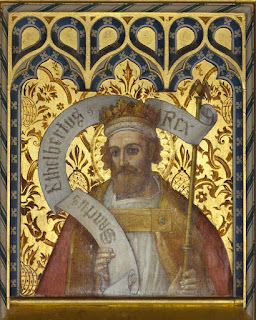 The powerful Ethelbert was at that time king of Kent; he had extended his dominions as far as the great river Humber, by which the Southern Saxons are divided from the Northern. On the east of Kent is the large Isle of Thanet containing, according to the English way of reckoning, 600 families, divided from the other land by the river Wantsum, which is about three furlongs over, and fordable only in two places, for both ends of it run into the sea. In this island landed the servant of our Lord, Augustine, and his companions, being, as is reported, nearly forty men. They had, by order of the blessed Pope Gregory, taken interpreters of the nation of the Franks, and sending to Ethelbert, signified that they were come from Rome, and brought a joyful message, which most undoubtedly assured to all that took advantage of it everlasting joys in heaven and a kingdom that would never end with the living and true God. The king, having heard this, ordered them to stay in that island where they had landed, and that they should be furnished with all necessaries, till he should consider what to do with them. 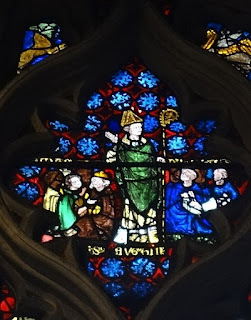 For he had before heard of the Christian religion, having a Christian wife of the royal family of the Franks, called Bertha; whom he had received from her parents, upon condition that she should be permitted to practice her religion with the Bishop Luidhard, who was sent with her to preserve her faith. Some days after, the king came into the island, and sitting in the open air, ordered Augustine and his companions to be brought into his presence. For he had taken precaution that they should not come to him in any house, lest, according to an ancient superstition, if they practiced any magical arts, they might impose upon him, and so get the better of him. But they came furnished with divine, not with magic virtue, bearing a silver cross for their banner, and the image of our Lord and Saviour painted on a board; and singing the litany, they offered up their prayers to the Lord for the eternal salvation both of themselves and of those to whom they were come. When he had sat down, pursuant to the king's commands, and preached to him and his attendants there present the word of life, the king answered thus: ­ "Your words and promises are very fair, but as they are new to us, and of uncertain import, I cannot approve of them so far as to forsake that which I have so long followed with the whole English nation. But because you are come from far into my kingdom, and, as I conceive, are desirous to impart to us those things which you believe to be true and most beneficial, we will not molest you, but give you favourable entertainment, and take care to supply you with your necessary sustenance; nor do we forbid you to preach and gain as many as you can to your religion." Accordingly he permitted them to reside in the city of Canterbury, which was the metropolis of all his dominions, and, pursuant to his promise, besides allowing them sustenance, did not refuse them liberty to preach. It is reported that, as they drew near to the city, after their manner, with the holy cross, and the image of our sovereign Lord and King, Jesus Christ, they, in concert, sung this litany: "We beseech Thee, O Lord, in all Thy mercy, that thy anger and wrath be turned away from this city, and from the holy house, because we have sinned. Hallelujah." As soon as they entered the dwelling­-place assigned them they began to imitate the course of life practiced in the primitive church; applying themselves to frequent prayer, watching and fasting; preaching the word of life to as many as they could; despising all worldly things, as not belonging to them; receiving only their necessary food from those they taught; living themselves in all respects conformably to what they prescribed to others, and being always disposed to suffer any adversity, and even to die for that truth which they preached. In short, several believed and were baptized, admiring the simplicity of their innocent life, and the sweetness of their heavenly doctrine. There was on the east side of the city a church dedicated to the honour of St. Martin, built whilst the Romans were still in the island, wherein the queen, who, as has been said before, was a Christian, used to pray. In this they first began to meet, to sing, to pray, to say mass, to preach, and to baptize, till the king, being converted to the faith, allowed them to preach openly, and build or repair churches in all places. When he, among the rest, induced by the unspotted life of these holy men, and their delightful promises, which, by many miracles, they proved to be most certain, believed and was baptized, greater numbers began daily to flock together to hear the word, and, forsaking their heathen rites, to associate themselves, by believing, to the unity of the church of Christ. Their conversion the king so far encouraged, as that he compelled none to embrace Christianity, but only showed more affection to the believers, as to his fellow­-citizens in the heavenly kingdom. For he had learned from his instructors and leaders to salvation, that the service of Christ ought to be voluntary, not by compulsion. Nor was it long before he gave his preachers a settled residence in his metropolis of Canterbury, with such possessions of different kinds as were necessary for their subsistence. 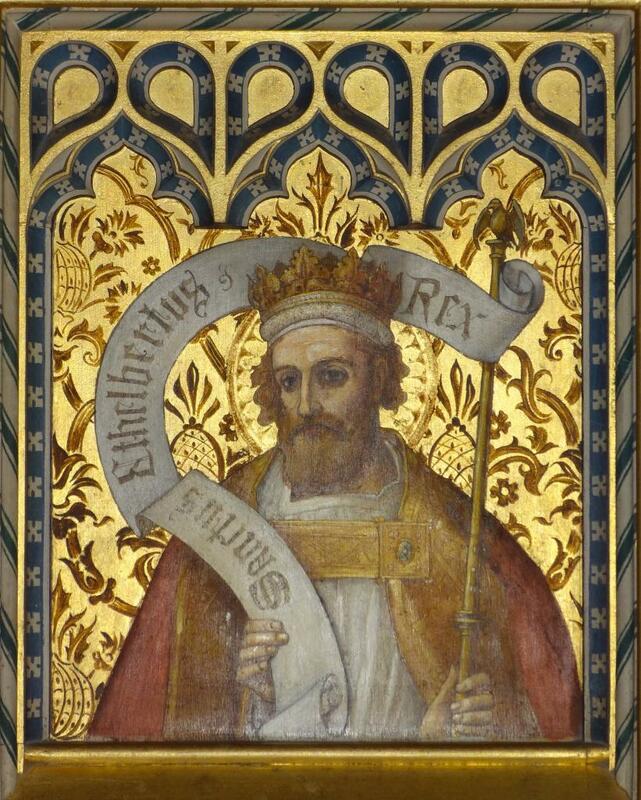 King Ethelbert died on the 24th day of the month of February, twenty-one years after he had received the faith, and was buried in St. Martin's porch within the church of the blessed apostles Peter and Paul, where also lies his queen, Bertha. Among other benefits which he conferred upon the nation, he also, by the advice of wise persons, introduced judicial decrees, after the Roman model; which, being written in English, are still kept and observed by them. In telling of the king's death, Bede carefully (though not perhaps accurately) notes the length in years of Ethelbert's reign and the geographical extent of his kingdom, as if to underline the point that the king is departing from these temporal and territorial limits to a kingdom without boundaries and without time. 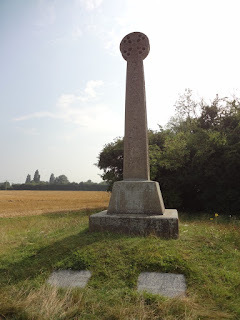 Here in the realm of time and space, we make a virtue of these limits by commemorating the when and where of history: keeping anniversaries and marking sites. 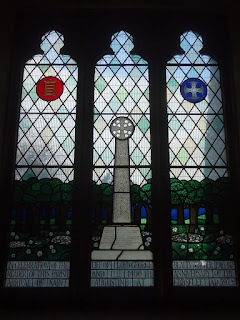 Most of the images in this post are of physical memorials to Ethelbert and Augustine from the area where they are most plentifully memorialised, in Canterbury and the Isle of Thanet. In this region a disparate collection of memorials, many more than are pictured here, commemorates not just the people in this story but the places where it played out, the meaning-rich landscape of island and mainland, marginal shore and royal capital, which is symbolic as well as real. 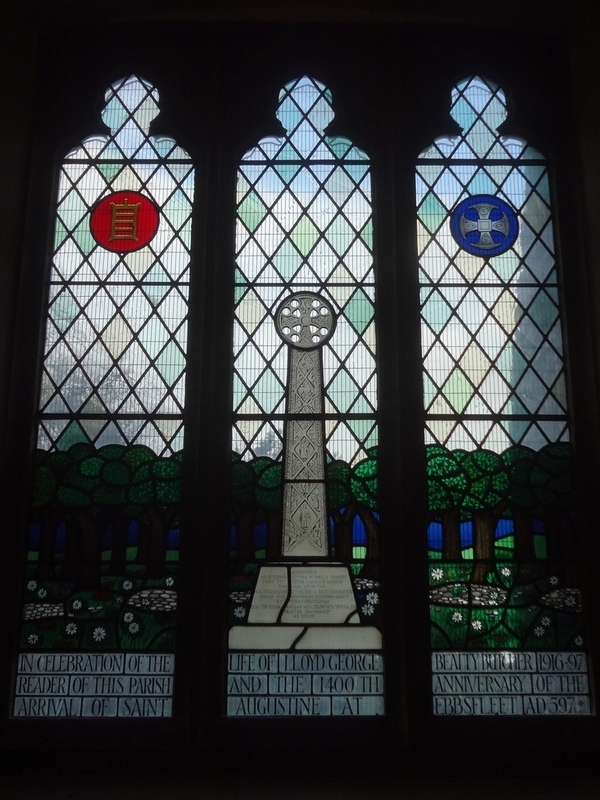 Thanks to a combination of folklore, genuine continuity, and dedicated local history-making, you can visit most of the sites mentioned in Bede's story, from the shore where Augustine landed to the well where he baptised the king, to the city where Queen Bertha's church still stands, the cathedral soars, and the foundations of King Ethelbert's burial-place are neatly marked out in English Heritage stone. If so inclined, you can now walk the way (or even canoe it) in Augustine's footsteps. Some of these memorials also mark anniversaries. This cross, erected in 1884, is near the supposed site of Ethelbert's meeting with Augustine, and was the focus of celebrations for the 1300th anniversary of Augustine's arrival in 1897. One of my own first encounters with Anglo-Saxon history was witnessing the commemoration of the 1400th anniversary in Ramsgate in 1997 (I was eleven years old, and it would be nice to say that this event fired me with a love of Anglo-Saxon history and inspired me then and there to become a medievalist - but actually I don't recall being especially clear on what we were commemorating...). 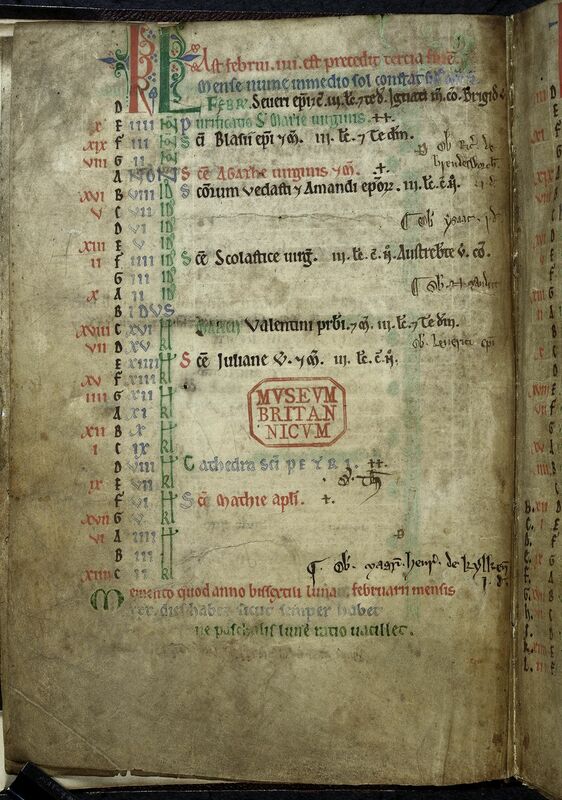 Ethelbert is the first Anglo-Saxon king whose date of death we know in part because the coming of Augustine, of Christianity, also brought to the English new ways of marking time and of recalling and commemorating history. Like the making of memorials, the marking of anniversaries is a creative act, a work of the historical imagination through which we can locate ourselves in time as well as place, with ever-richer possibilities as the passage of time adds more and more layers. So perhaps it's a good day to celebrate not only Ethelbert but the historian who gives him to us. 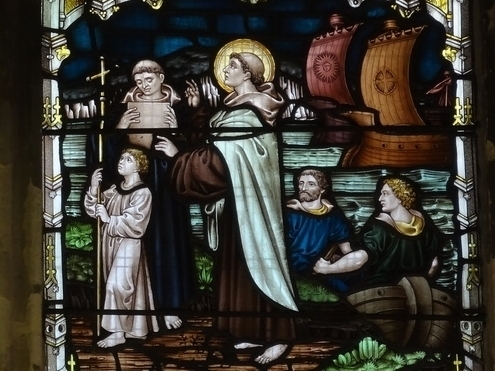 Bede looked back on Ethelbert from the distance of 140 years, and we're now 1400 years away; but with even the historian's history under threat, it's all the more important to go on telling his stories. You can read the whole poem here (or, for a rather more daring translation, here's Ezra Pound's version - and listen to this!). The Seafarer is a poem I admire more every time I read it: it's an irresistible poem, strange and beautiful in its strangeness, restless, urgent and uncompromising. 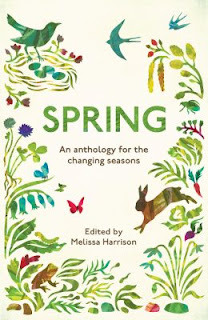 Although not 'nature writing' in the sense we would understand it, it offers as complex and ambivalent an approach to the season of spring - the season as it interweaves with human experience - as any later poet could hope to create. The spring of The Seafarer is an uncomfortable, eager season, impelling movement and growth; the voice of the poem, like the cry of the cuckoo and the soaring seabird-soul, 'greedy' and never satisfied, calls to those of us - and so really to all of us - not truly at home in this world. It presses ever onwards, away from safety and comfort out onto the moving waters. In my last post I talked briefly about love and 'longing' in Anglo-Saxon poetry, but The Seafarer's most famous line of longing pushes away from, not towards, human love: A hafað longunge se þe on lagu fundað, 'He always has a longing who sets out on the sea'. Anyway, I'm very pleased to be part of this anthology; this the first time I've ever seen any of my writing in an actual physical book, so it's pretty exciting for me! I'm especially glad that the editor chose to include some medieval poetry (Chaucer's there too), since the first six centuries of English literature are all too often overlooked in collections like this. One of my favourite things in blogging about medieval literature is introducing it to people who might not otherwise encounter it; and though The Seafarer is not the most obscure example, and is just the tip of the iceberg (an apt metaphor for such an ice-bound poem) of the wonders of Anglo-Saxon poetry, it belongs among any collection of the best writing in English. Do take a look at this book - it's a beautiful volume. A long, long time ago, back in the early days of this blog (2011) I wrote two not-entirely-serious posts compiling some lists of Medieval Compliments and Medieval Terms of Endearment. To my surprise and amusement these have since proved to be far and away the most popular posts on this blog, with page-views in the tens of thousands. They always get a big spike around Valentine's Day, and I like to think that people are still using them (along with my Resources for a Medieval Valentine's Day) to add a little medieval flavour to the day. Most of the words and phrases in those posts came from Middle English texts, so today I thought I'd offer up some Old English terms in which you might wish to express your admiration or love. Now, some people will tell you that Anglo-Saxon literature is devoid of romance, and it is true that the Anglo-Saxons did not write much love poetry, nor did they celebrate St Valentine's feast as a romantic holiday (surely proof, if any more were needed, that English literature has been going downhill since 1066). But while romance may have come to us (etymologically and historically speaking) from the French, it was the Anglo-Saxons who gave us the word love - and there's plenty of love in Old English literature, if you're looking for some inspiration today. the mourning cuckoo sing in the woods. if he has you, prince's daughter. You're going to need the dual pronoun wit 'we two' if you want to compose a properly intimate Old English love-message. Let's try again. The heroine of Judith is described (by the narrator this time) as gleaw on geðonce, ides ælfscinu 'clever in thought, a woman beautiful as an elf' - both excellent terms of praise. I don't really think you can beat 'elf-shining' as a compliment, but there's also fæger ('fair', obviously) and wlitig 'beautiful', which works for both men and women: St Guthlac, for instance, is described as wlitig on ansyne 'beautiful of face' and Eve (in the poem Genesis) as wifa wlitegost 'most beautiful of women' and wlitesciene wif 'woman of radiant beauty'. Juliana's flatterers aside, lovers in Old English poetry tend to be on the restrained side with their terms of endearment. Even in The Wife's Lament, the speaker mostly calls her husband min freond and min wine, which both mean 'my friend'; min wine is also the heroine's choice of address in the fragmentary Waldere, in the middle of an impassioned speech, so it must have had more intimate overtones than simply 'friend'. But my favourite endearment was one I mentioned in this post, from a sermon in which God, speaking to the Virgin Mary, calls her min meregrot... min eorclanstan 'my pearl, my precious jewel'. You're not going to get a better endearment than 'my arkenstone', now, are you? wait in longing for the beloved. Love is often described as surging, burning and 'hot' - like the treowlufu, hat æt heortan, 'true love, hot in the heart' of Christ II (539). 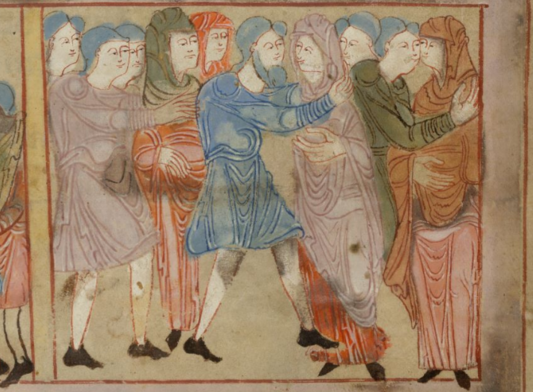 With hot hearts and love-longing we should mention a third alliterative pair, the verbs clyppen and cyssan 'to embrace and to kiss', which frequently appear together. (Hug came later, probably from Old Norse - those cuddly Vikings!). a mourning heart, not lack of food. Gif ðu wundrige þæt swa scamfæst fæmne swa unforwandigendlice ðas word awrat, þonne wite þu þæt ic hæbbe þurh weax aboden ðe nane scame ne can þæt ic silf ðe for scame secgan ne mihte. If you wonder that so modest a girl should so boldly write these words, then know that I have declared to you through wax, which does not know shame, what I myself could not say to you for shame. þæt mæden hæfde unstille niht, mid þare lufe onæled þara worda and sanga þe heo gehyrde æt Apollonige. The maiden had a restless night, kindled to love by the words and songs which she had heard from Apollonius. liþ him on londe þæs his lufu bædeð. gebidan þæs he gebædan ne mæg. to the Frisian's wife, when the ship docks. grants him on land what his love asks for. wait for what cannot be hastened. How's that for Anglo-Saxon romance?